Ok, so its tax season and my refund will be here next week. I'm up in the air about whether I should get wheelset with powertap 2.4 SL+, which I can get with the wheels for $1700 through a sponsor OR get a decent track bike to train with at the 'drome and enter some track races with every once in a while. NOTE: At some point I'll end up owning both, but if have to have one over the other for now, what'll it be? Do you want to be a better road racer, or a better track racer? That's not really an either/or. Being a better track racer can make you a better road racer. I vote track bike - it will get you racing in a new environment. Racing at the track every week will make you stronger - it's fast and constant and requires strength to jump a high gear and a smooth spin to keep it going. Additionally, if you're going out to omniums every week, you get to watch a lot of races - last year my local velodrome had 1/2/3, 4, and 5 races on the same night (women, masters, and juniors on another night)... it meant that not only did I get to race, but I also got to watch the elite riders race, around and around, which was a great opportunity to learn how races develop, how racers with different strengths could use different race formats to their advantage, and what kinds of moves (and when) could turn into winning moves. That's not really an either/or. In the context of the current situation it is. If, right now, the OP wants to become a stronger track rider then it makes sense to get the track bike. However, if the OP wants to focus on road right now, then certainly get the PT and start identifying/improving those limiters. First off, $1700 is no great deal on a PT, and you don't need a whole wheelset. I'd say to buy the PT and rent a track bike for a while. Then you get the benefit of both. The PT on the road bike can help you on the track bike too. I think you'll be faster on the track with a rented track bike using a PT to train than you would be with your own track bike and no power training. Also, if you gave me $1700 to solve this problem, I'd have a PowerTap and a track bike at the end of the deal (used, which is what you'll have a week after you buy them new anyway). top pic is how it's set up now.. If you're going to be spending $1700 on a Power meter, you should also consider a Quarq Cinco Saturn. Hey, I'm making progress, at least I got Quarq right. that's a nice bike and all -- but do they let you run a brake at the velodrome? The OP is actually talking about racing on a TRACK, not just riding a fixie around town. edit#2: could your increased speed have anything to do with riding more? Last edited by kudude; 02-12-09 at 09:28 AM. quarq is indefinately backorderd...from what ive been told. I'd end up with a used Fuji Track Pro and an SRM though. Track is great place place to learn tactics, handling, and positioning; very compressed environment in which you might get 6 races in one event to practice. Plus it's fun. Fun is hugely underrated by bike racers. Very true; at least in many that I know. Front fork is drilled for a brake... I installed it for safety on the road if needed.. i don't ride the bike in town... yesterday's 40 mile ride was a blast.. except for the 40 degree rain... that sucked! I don't think most velodromes like brakes... not difficult to take off if going to the track.. If there was a velodrome neer me it would be a no brainer. I was just pointing out that the fact that you have a bike with one gear that does not freewheel is unrelated to the OP's question. Racing on the track and riding a fixed gear for fitness are very very loosely related. You've been told wrong. From what I've been told. Even the website says they will ship within 1 week. And to answer the OP, yes, for $1700 I'd have a brand new Fuji Track Comp, a used PT SL and still have a few hundred left over. Last edited by cslone; 02-12-09 at 01:17 PM. 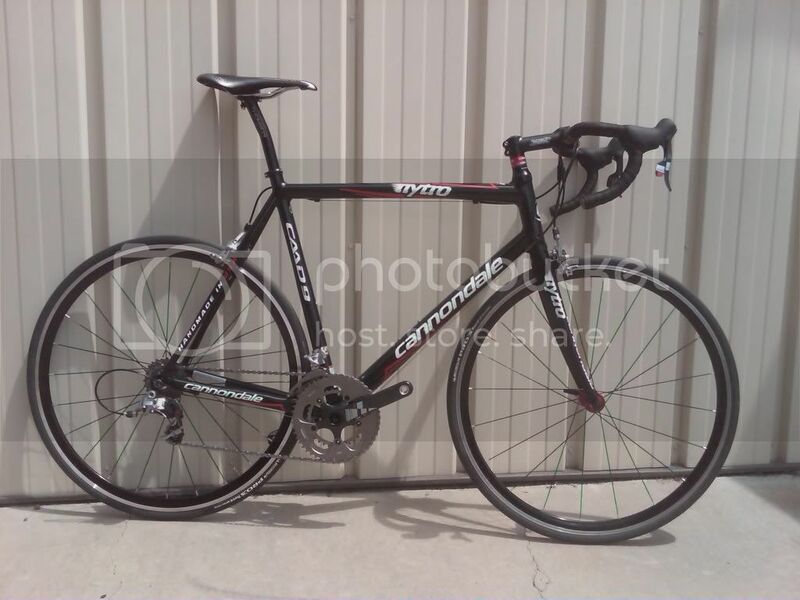 If you have $1700 you can buy a power tap rear wheel and a track bike. If you ride criteriums, definitely go for the track bike. As RX said, its great bike handling experience. It will also improve your sprinting ability, which of course is very necessary for crits. Also, if you take up pursuit on the track, you will develop an absolutely killer skill for crits, being able to go, on your own, at 30-34 mph for a substantial period of time. +1 to all the "you can buy a bike and a PTap." Also, it's (smart) training with a power meter that's going to make you faster, not a track bike. Last October, I sold my somewhat unremarkable track bike for $600 and bought a PTap SL 2.4 on an Open Pro rear for $650. I'm twice the rider now I was then, and that's just from offseason training. Best decision I've made in my short cycling career, with my professional bike fitting a close second. yeah, but why do you have a saddle bag on it?